A United Launch Alliance Atlas V rocket with the PAN satellite launches from Space Launch Complex-41 at Cape Canaveral Air Force Station, Fla., at 5:35 p.m. EDT on Sept. 8, 2009. 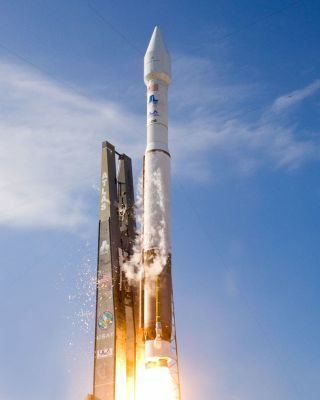 Amysterious spacecraft whose mission is cloaked in secrecy left Cape Canaveralatop the hard-to-miss roar of its Atlas 5 rocket and then revealed a major clueabout itself while cruising above a satellite-tracking hobbyist a short timelater. The 19-story booster blasted offat 5:35 p.m. EDT, the first moment of the day's launch opportunity thatpunctuated a trouble-free countdown. The rocket's nose cone,adorned with Lockheed Martin's corporate logo, shrouded the payload as itclimbed through the atmosphere and out of sight. The company acknowledgedthat it had builtthe communications satellite -- dubbed "PAN" -- under acommercial arrangement with the government. Yet few other details werereleased, such as what agency was behind the project or what it would do inorbit. "Lockheed Martin isthe prime contractor for the PAN mission, which includes a commercial-basedsatellite and launch system solution for the U.S. government," a LockheedMartin statement released to Spaceflight Now said. Within 18 minutes, theCentaur upper stage turned off its main engine and settled into an initialparking orbit where it would coast away from the planet for 98 minutes. A group of respectedskywatchers around the world who track satellites with remarkable precisionand communicate their findings amongst each other online eagerly awaitedTuesday's launch and a chance to test their pre-flight guesses against reality. The leading theory suggestedPAN was a quick-build satellite that would serve as a communications gap-fillerbetween the aging constellation of Ultra-High Frequency Follow-On (UFO)spacecraft and the sophisticated next-generation Mobile User Objective Systemthat's still being developed. Some 34 minutes after theAtlas launched from Florida, observerGreg Roberts, a retired astronomer living in Cape Town, South Africa,detected "a strong beacon signal" being emitted from the PANsatellite as it crossed his sky. "The time, generallocation of the signal in the sky, and its Doppler shift were consistent withthe expected parking orbit," said Ted Molczan, a noted member of thetrackers. For 14 minutes, Robertsheard the passing satellite transmitting a frequency unique to the UFOspacecraft. He had to cut the session short due to bad weather, but thehobbyists immediately knew their speculation was proving well founded. "We know of no otherU.S. satellites in geostationary orbit that use that frequency, so Greg'sobservation tends to support the UFO-MUOS gap-filler hypothesis," Molczansaid. Roberts, like others in thesmall international group of hobbyists who find and watch satellites in secretorbits, does his observing using telescopic still and video cameras, and radioreceivers. The east-bound trajectorysent the Atlas into an elliptical geosynchronous transfer orbit, though thepower provided by the rocket coupled with the payload's relatively slim weight,estimated by the observers to be approximately 7,700 pounds, enabled a higherperigee, or low point, than other such launches. A second firing of theCentaur propelled PAN into its targeted deployment orbit with an apogee of22,230 miles and a perigee of 4,550 miles. The payload's release an hour and 59minutes after liftoff successfully completed the ascent. "The secrecysurrounding PAN may be a clue to the identity of its sponsoring agency. Itappears not to belong to the DoD, given that its UFO and MUOS are openprograms, as was the U.S. Navy's 'UHF Hosted Payload' gap-filler solution,which it briefly considered in 2008," Molczan said. "The most likelyremaining possibility is that a civilian intelligence agency, perhaps the CIA,decided much earlier, about 2005-06, that it could not risk a coverage gap, andobtained approval to rapidly procure and launch a satellite compatible with theUFO satellites," Molczan added. An article in a LockheedMartin newsletter, entitled "A small and persistent team turns a greatidea into an important new U.S. program" and published in the spring of2007, said its Special Programs had started the PAN mission, also known as theP360 project. "The team's innovativeturnkey commercial-based satellite, ground and launch system solutionestablished the foundation for a new government architecture. The teamfunctions across time zones from Space Systems Company in Sunnyvale, Calif., toCommercial Space in Newtown, Pa., Lockheed Martin Information Systems &Global Services in San Jose, Calif., Integral Systems in Lanham, Md., as wellas Lockheed Martin divisions abroad. United Launch Alliance in Denver, Colo.,rounds out the contributors with the Atlas 5 launch vehicle," the articlecontinued. "Following severalyears of concept development, market analysis, and finally proposal submittal,the contract was awarded to Lockheed Martin in October 2006. The team has hadsuccessful system and preliminary design reviews and is on schedule for launchin 30 months from contract start." The observers plan tocontinue monitoring the moves of the satellite in the coming weeks as itmaneuvers into a circular geostationary orbit. Its destination could furtherbolster their guess. "If it occupies one ofthe established UFO orbital slots, and transmits on the established UFOUHF-band frequencies, that will fully confirm the present hypothesis. That willtake at least several weeks," Molczan said. A later newsletter fromDecember 2007 quoted the PAN program manager as saying: "Our PAN P360 teamjust celebrated our first anniversary since contract award. As program manager,I am very proud of the extraordinary effort and excellent team that has beenleading this endeavor. We have successfully hit every milestone on a 30-monthfirm-fixed-price program that will change the future of how government programswill be contracted and run. "Thisopportunity is a great challenge to build a government satellite that uses theA2100 spacecraft bus and commercial off-the-shelf components and processes.There are numerous future Lockheed Martin opportunities that hinge on thesuccess of this program."